Discussion in 'Flat Earth' started by Mick West, Nov 14, 2016. When people want to practically illustrate the curvature of the Earth, they often give the example of a boat disappearing over the horizon. While the boats example is perfectly valid, it's quite hard to observe and the effects of refraction make it confusing to interpret. It's also hard to repeat as you need a good boat. Mountains, on the other hand, rise up above the distorting effects of refraction and you can usually get a very good fit to the peaks using Google Earth which allows you to show exactly how much is obscured by the horizon. They are also very repeatable, weather permitting the distant mountain is generally visible in the same way many days of the year. For example observing the partial hiding of Catalina Island is an easy experiment anyone in Los Angeles can do with a quick ride to the beach. I thought perhaps I'll start a thread collecting these examples, with locations, so that people can replicate them if they are having doubts about the rotundity of Earth, or just for a fun science experiment. What you need is a tall island, preferably a mountain or volcano, that's between 30 and 60 miles off the coast. (It does not need to be an island specifically, but does need a mountain near its coast) You then need to take a photo of the island from near the waterline so that a significant portion of it is obscured by the horizon. Then you need to demonstrate how much is hidden, you can do this by measuring it based on the camera field of view. Or by fitting it to the view in Google Earth from the same distance, but higher viewpoint. Ideally you would have several photos from different altitudes, showing more if the land is visible from high ground, and a lot less down at 2 feet above the water. You don't have to take the photos yourself, you can use photos on the Internet of common places (like Hawaii). So long as you can identify the camera location, and the mounting being viewed, then you can apply the process and figure out how much is being hidden. Surprisingly a great source of these photos is the people who believe the Earth is flat. Generally they miscalculate how much of a distant peak or skyscraper should be visible. They will forget to factor in the view height, or they will ignore refraction, or perhaps misidentify the peak. Then they will post the results on YouTube as proof that the Earth is Flat. 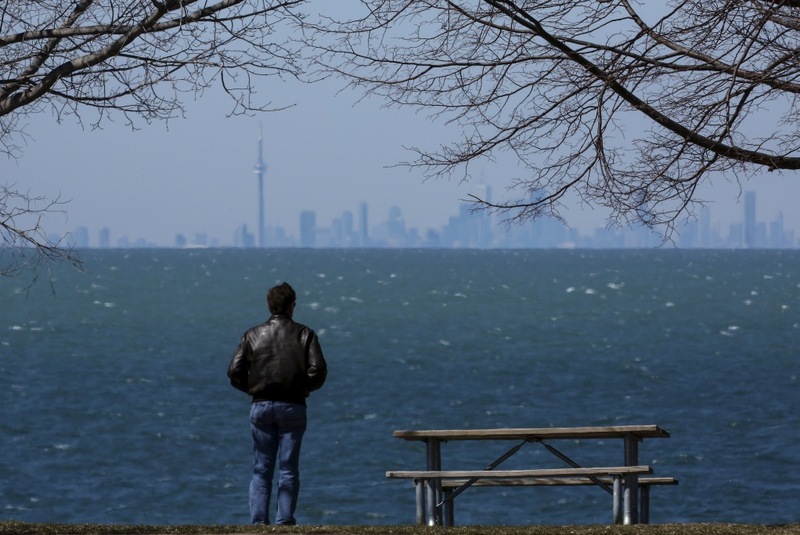 This video of Toronto was taken by Jenna Fredo. 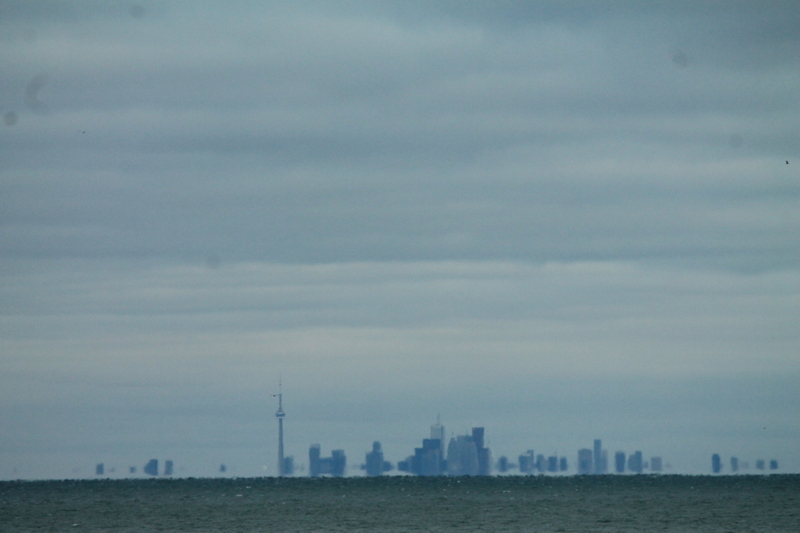 It was taken across Lake Ontario from a place called Niagara on the Lake. Viewer elevation is 37 feet, distance to target Rogers Center Dome is 30.86 miles.Humidity was 50%. Elevation of ground where Dome is built is 262 feet, dome is 282 feet tall. According to this dome should have been hidden 50 feet below the curvature. Yet it can be clearly seen. Refraction was included into calculations because calculator used for curvature was by Mick West from metabunk. Check it out guys and let me know what you think! So it's just looming of the lowest structures. Incidentally, this would be an ideal location for the "stand-up" demonstration of the Earth's curvature. On a clear day with limited refraction there would be a very distinct difference with what is visible - especially with the large varity in height of building, and the easy identification of the skyline features. does not seem like looming to me.. because the tallest building left of the tower should also be looming then.. and it's height differential from the building partially covering up the dome matches with the height difference from other photo.. yet in your comparison dome should be hovering above the taller building left of the tower.. and this is clearly not the case..
Could these effects looming, refraction, mirrage work both ways? In a way to make things look like they are behind the curve when they are not, and make things look like they are not behind the curve when in actuallity they should be, or is it a one way streat and these effects always work "against the curvature"? Sorry for a messy question I hope you understand what I am asking? So could they work "with the curvature" and "against it"? The actual degree of compression varies. Unfortunately the video images are quite hard to make out, but there's nothing really out of line as far as I can see. You seem to be asking in, on a flat Earth, refraction effects could make it look like the Earth is round. No. Because the less refraction there is, the more what we see approaches the ideal view of a globe earth. i.e. when there is little refraction you get a very sharp horizon at about the right distance, and obscuring about the right amount of distant objects with very little distortion. This can be seen very clearly with my Venice/Santa Monica photos. You have a very clear horizon in focus with detail of the water surface all the way up to the horizon and the buildings (and boats) that are behind the horizon exhibit near zero vertical distortion. This cannot be explained by "refraction" on a flat earth. 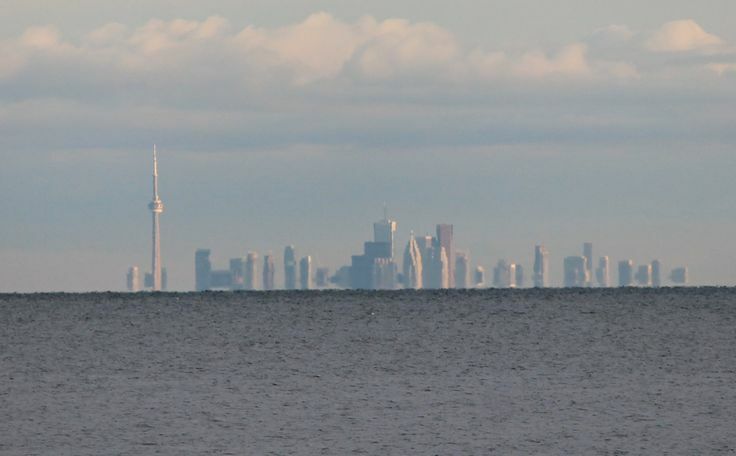 If there was refraction hiding the distant shore then there would be distortion at the horizon. There is no distortion, so it's not refraction. Ok.. makes sense. I just can't shake off the feeling its a rather convenient way to explain one situation over the other. Not saying its not true.. I am no expert on atmospheric distortions. I just had a feeling refraction can go both ways.. diff temps, humidity etc. could cause light to bend in a way to compliment the curve, or counter it. These are just my amateur thoughts tho.. so won't go further into it or try to debate you because truth is I don't know enough about it to do so. I think it's bad if we learned in detail about refraction by observing long stretches of distance on earth, since we need to assume things about earth before we "nail" the refraction, and that makes it pointless to use that same refraction as a reverse engineer tool to prove what we assumed about earth in the first place. That would make it sort of like dating how old something is, but first u need to assume how old it is. Circular reasoning. On the other hand I think it's good if we learned about refraction in controlled lab conditions. So we can use that precise knowledge and apply it to real life conditions that are always more complex but at least we have a good solid base to work with. We can take temperature and humidity readings at various altitudes, sun position, etc to get a more precise result. Well that's basically what happens. The science of how light travels through a medium is very well understood. The factors that alter refractive index are very well understood. The problem to those who refuse to accept any science is that you've got to derive that from observations and first principles, and most people are not capable of that. Think about the general situation. We've got many verifiable situations where buildings and mountains are hidden by a clean horizon with little or no distortion. We can do the math and see that the amount hidden is generally just a bit less than the expected amount for a globe Earth with no atmosphere - based on inarguable geometry. These are things you can verify personally. We know that the air gets thinner as we go higher, and we know how much on average, and can verify it personally by walking up a mountain with a barometer. We know light bends towards a more dense medium, towards the medium with a higher refractive index. (which we can verify with a variety of simple experiments) , so we know that looking towards the horizon will bend the light down very slightly. Now as we are on a globe these observations all fit. We'd expect the horizon to obscure buildings. We'd expect to see a bit more than if there were no atmosphere. We can even explain the times when we can see even further or less past the horizon than normal, when the temperature gradient of the air is more, or less, or inverted. The problems only start when you introduce the idea of a flat earth. Now you could theoretically explain away in the distorted images and mirages as the effect of refraction - after all we see heat mirages on roads, and they sometimes create a false horizon. But how does refraction and a flat Earth explain the case of a sharp horizon, and an undistorted background? How does refraction and a Flat earth explain how more and more of a mountain is gradually visible as you get higher - exactly simulating the expected figures from a round Earth? How does it explain these three photos I took (all unaltered other than lining them up)? This is explained quite simply by the world being round. The island is just behind the curve of the ocean. How can you explain these photos by the world being flat? How is refraction so closely simulating exactly what we expect from a round world? How can you explain it by the world being flat? How is refraction so closely simulating exactly what we expect from a round world? Thx Mick for your time. Here I've used the observation deck of the CN Tower as the reference point. Again we see this huge compression of things near the horizon. Compare with Post #6. Here I've used the observation deck of the CN Tower as the reference point. Again we see this huge compression of things near the horizon. huh. I ran across @jenna1789 's video on another video. Then found this thread. That is actually amazing how the buildings in the back (red circle) completely shrink up. Wild. Just another comparison from @jenna1789's video. Showing how it's obviously a mirage. Playing around with the new mirage simulator. Here's what you would expect to see if the Earth was flat, with no atmosphere, from five feet, 30.85 miles away. Here's the globe earth view with the standard atmosphere, more building are visible, but not the Rodger's center. The rays are bent downwards a little, so you can see over the horizon a bit more. They bend down because light bends towards more dense air. The lower air has a higher pressure, so it denser. The decrease in temperature as you get higher counteracts this a bit, but overall still bending down. Here it is with a slight temperature inversion, just an increase of about 1°C over 100 feet, with a steeper increase near the lake surface. The Rodger's center is now in view, and distorted in a similar way to the video. The light is bending down more because the cooler air near the lake surface is denser. this is still from 5 feet above the water surface. Added a laser dot at the shoreline. Visible from 30 miles away, viewer height of 6 feet. I used this shape for the inversion, from this description of a ducted mock mirage. Looking at Dr. Andrew Young's site, it just seemed to me to be the best match. I'm afraid that if you look at this page you'll find that there's still another variable - the distance to the target. I'm sure the sun is actually well below the horizon at this point. I wonder how far? Note the height of the gradient graph has an effect on what you can do - the one you used is goes up to 200 feet, making it harder to edit the values closer to the ground. One thing I should fix is the current lack of temperature lapse above the top of the graph - the current RI gradient is just from pressure, so a bit bigger than it should be. Just a minor smoothing thing really. Not significant in terms of visibility. The shape you were using was actually more like mine, you had some of yours below zero, which would have been ignored. I didn't even notice until later that the scale went below zero. But I think it's pretty solid that the original YT video is showing the effects of ducted rays. Whether we should call this a superior mirage, a mock mirage, or a late mirage I don't know. NACHSPIEGELUNG: Alfred Wegener's term for the “late mirage” seen by an observer within a duct after the Sun has passed the “reflecting” or “obscured” strip (i.e., the superior mirage) produced by a duct. 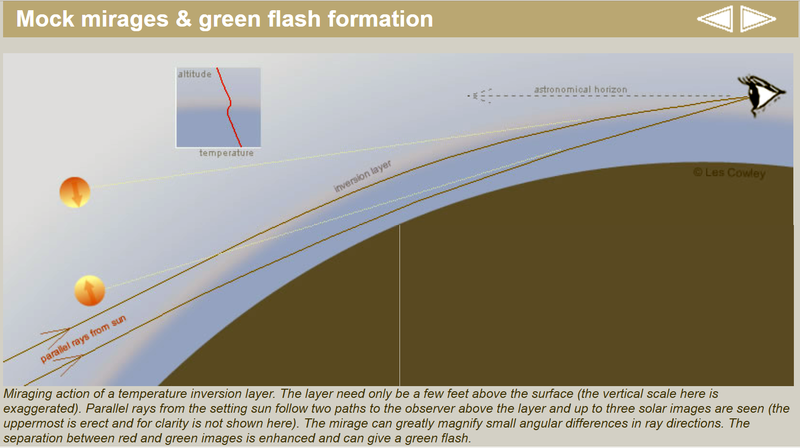 See the ray diagram on the mirage page, and the table of refraction phenomena. "The observer within a duct" does not necessarily equal "the observer within the inversion." It's possible to be below the inversion but within the duct. This horizontal “blank strip” or “forbidden zone” was pointed out by Alfred Wegener in 1918. 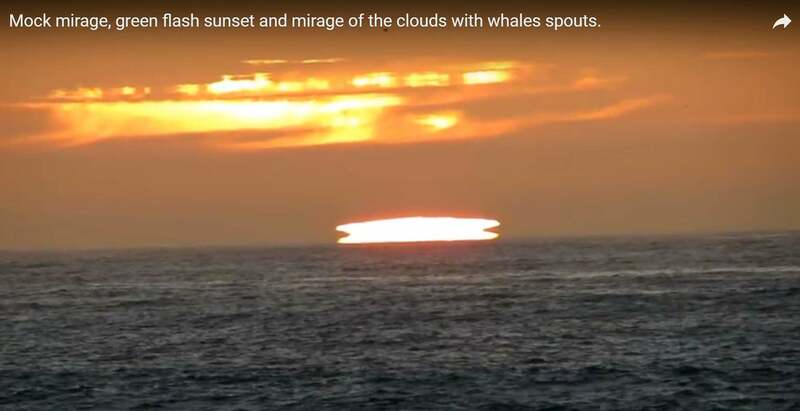 Wegener called it a “reflecting” or “miraging” strip when he was discussing mirages, and a “blank strip” when discussing sunsets; he says:The reflecting strip of the terrestrial mirage … becomes a blank strip in the solar image. This page talks about the sun - an astronomical body - so we need to be careful when using this info when we are talking about even a distant terrestrial object. 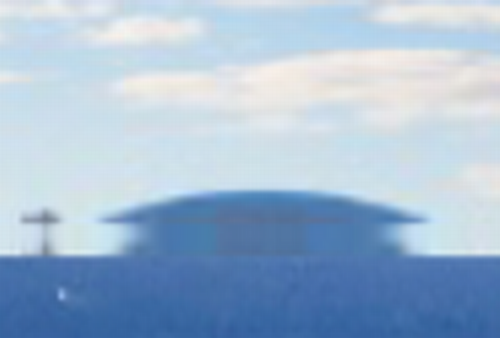 The best I can say is that we appear to be seeing an inverted image of the Rogers Centre Dome above an erect image. The erect image is only the upper part of the dome, which itself would normally be hidden. The inverted image has a flat top because the erect image is cut off in a straight line by the horizon and the inverted image also has this straight line, but at the top. In this case it's a true superior mirage. Alternatively it might be an erect image over the lower erect image - with a very compressed inverted image between. A 3-image mirage. The top erect image is flat topped because it is "squashed." Notice that the top image is not completely flat topped. There does seem to be a hint of a curved dome shape. Mock-mirage sunsets are very sensitive in their appearance to your height. You must be above the inversion layer but not necessarily physically very high because inversions can be very close to the land or sea surface. Because the mock mirage is produced by the change in lapse rate at the base of an inversion, it's visible to most observers above that base. But the shape of the stooped zone above the mock mirage changes when the observer passes through the top of the inversion. At the right is an ordinary mock-mirage simulation for an observer at 45 m height, which is 5 m below the top of the inversion. (The rest of my ordinary mock-mirage simulations are for an observer 5 m above the top of the inversion.) I've moved the target out to 55 km to get a better example of the effect. I'm confused by this. Wouldn't this now just be a late mirage? That quite nicely brings things into view with minimal distortion. So I think we are seeing something just short of that.